Well, I totally fell for the silly, simple charm of One Punch Man, so was keen to watch the other series from creator One, and ended up catching up with all the available manga too. Honestly, there isn’t a whole lot of difference between One Punch Man and Mob Psycho 100. If you dislike one, I’m sure you’d dislike the other. Both centre on unassuming, rather goofy and socially awkward guys who just happen to be incredibly powerful, with the comedy usually turning on them being underestimated and then showing their strength – and then things can be serious when a genuinely strong opponent appears. Which, let’s face it, is basically the same schtick as the first year or two of Dragonball. And numerous other Jump series, too. Fortunately, though, I loved One Punch Man (and early Dragonball), so more of the same is good for me. Where One Punch Man focuses on superhero stories and builds upon that, for Mob Psycho 100, it’s ESPers, people with psychic power. Again, there’s a goofy main character who nobody thinks will be powerful, this time a young boy rather than a young adult, though they’re drawn extremely similarly. 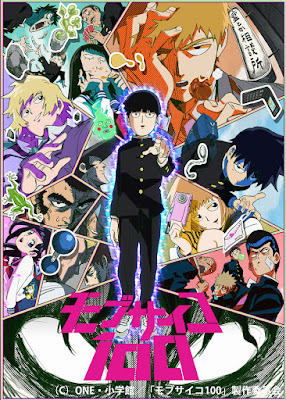 In rather a genius touch, the incredibly powerful young psychic works for a con-man, who until he met young Kageyama Shigeo (also known as Mob, the Japanese term for ‘background extra’) thought that psychic powers weren’t real and has been exploiting the gullible. There are a number of concurrent themes running through Mob Psycho 100. Shigeo wants to become popular, but is very easy to ignore. His brother is very outgoing and likeable but hasn’t been able to show any psychic ability. Shigeo comes up against evil spirits (one of whom becomes a comedic ally) and a rival psychic who follows a classic story path of being too proud, getting humiliated and then becoming an ally. The series, sadly only 12 episodes long, concludes with a satisfying battle against a shady hidden organisation, with plenty of bathos but also impressive action scenes. Like One Punch Man, this series doesn’t work purely on its premise, but by having very likable characters and actually being funny. The moment where Shigeo makes his decision on which school club to join will endure as one of the funniest moments in an anime I’ve seen for quite a while. Because I’ve now read the manga, I have to say that there’s a whole lot more material still to come that I’m looking forward to rather more than anything in this season. There are good emotional moments and some great action scenes. But certainly there is room in the world for both Mob Psycho 100 and One Punch Man, and I want more of both, much more, and soon. Alternating series of the two shows with all iterations of the manga and webcomic versions being sporadically released suits me just fine.